This black t-shirt is amazing looking and different. On the t-shirt, you can see a gas mask and in one of the eyes you can see a green glow and reflecting in that a battlefield and soldiers are coming. You can get this special gas mask t-shirt in men and women’s sizes Small – 3XL and it is made from 100% cotton. A t-shirt like this is real cool and unique and it kind of reminds me of video games. 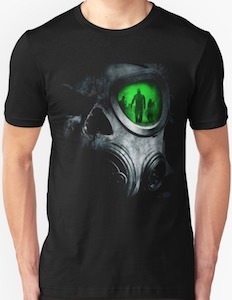 So if you like battlefields at night then this gas mask t-shirt is what you want especially as the green eye makes it look like night vision. This t-shirt looks like it has the Star Wars logo on it but it has not. On the shirt in the same font as the Star Wars logo it says “Stop Wars” instead of “Star Wars”. 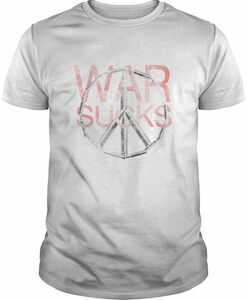 Of course we all want peace on earth and in the stars so this t-shirt is way better then one with the real Star Wars logo on it. 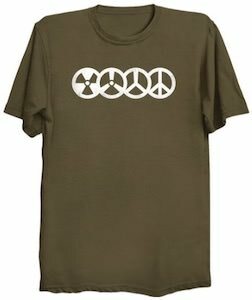 You can get this stop wars t-shirt in men and women’s version in many sizes and colors but all have the same “Stop Wars” logo on it.